The Market Umbrella ships in a cardboard box seven inches by seven inches by 64 inches. When you open the box you will find: The main umbrella frame with the canopy on, the lower pole, the finial (apple sized knob) and a large plastic bag. Step 1: Screw the lower shaft onto the upper shaft by twisting it clockwise into the brass coupler. Step 2: Screw the finial into the top of the umbrella by twisting it clockwise into the threaded hole. Step 3: Stand the Umbrella upright and lift it's ribs manually. It will open. Find the draw ropes. 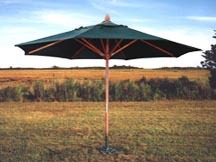 Pull the draw ropes to fully open the umbrella. Find the brass pin. It is attached to the main frame with a small brass chain. Push the pin through one of the adjustment holes in the shaft to set the height.